A powerful example of cinematic expression in graphic design, this poster is also interesting because the man at its center serves as an illuminating decoy. 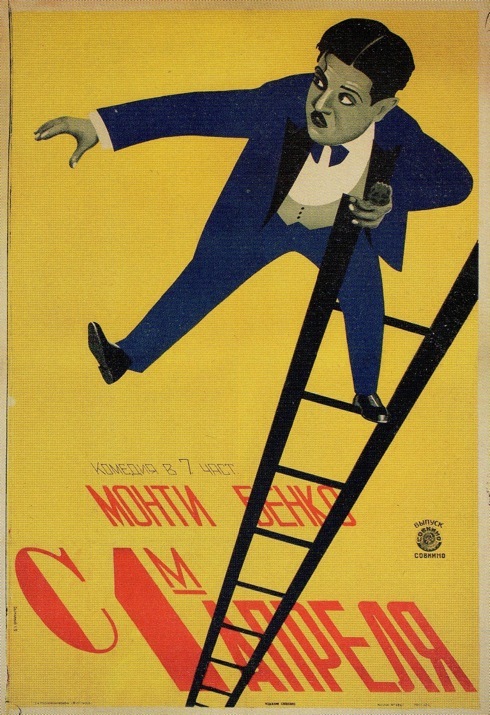 Though a dead ringer for Charlie Chaplin, the actor pictured is actually Monty Banks, and most likely this is a scene from Bank’s 1926 film Atta Boy, which prominently features a scene of him dangling off a ladder in the back of a car. The reason that a marginal actor like Banks was featured abroad was largely a result of the marketing strategies of the distributors. Films made by independent American actor/director/producers like Banks, Charles Ray, and Richard Talmadge, which played only in a few theaters in the United States due to tight control of the major theater chains by the large producers, enjoyed success in the USSR—especially since they were considered harmless screwball fare that lacked a political agenda. As a result, some films that were barely noticed in their home country occasioned the creation of top-notch Russian posters like this one. This poster is unsigned, but has been attributed to the incredible Stenberg Brothers.